Fall in North America, and autumn for folks from the subcontinent is a season synonymous with abundance of vegetables from the gourd family. There are competitions in North America for the largest pumpkin and then leading into Halloween a plethora of pumpkin carving activities. To be entirely honest, growing up we didn’t eat a lot of pumpkin. In India there are quite a few that are available. But the most common that is cooked as a savoury main is a variety called jade prince, the regular green pumpkin. So this fall, I decided to try my hand at cooking a Butternut Squash as my first foray into using pumpkins in my cuisine. The gorgeous golden flesh of the butternut was so inviting- I wanted to scoop it right out! But not so fast. Here’s how I cooked a savoury butternut entrée. Preparation time: 30 minutes; active – 20 minutes; inactive – 10 minutes. Take a heavy bottomed utensil – either a frying pan or wok style kadhai. Warm it up on high heat and then add cooking fat of your choice. To this add Fennel and Nigella seeds. Saute them until fragrant then add Fenugreek seeds. Overcooked fenugreek seeds taste bitter. Try to add them at the end and cook on low heat for just under a minute. Add cubed squash to the tadka. Once the tadka is ready, transfer the chopped butternut squash and stir. Season with salt, pepper, chilli powder and coriander powder. Soft and ready to eat. Mix well and cook covered for 10 minutes or until the squash feels soft and mashes easily. That’s it! Achari kaddu is ready to be enjoyed with a hot chapati. Gorgeous! I swear I’ve seen many a squash dish, sometimes curried, in my Indian cookbooks – I guess it depends where in India you live. 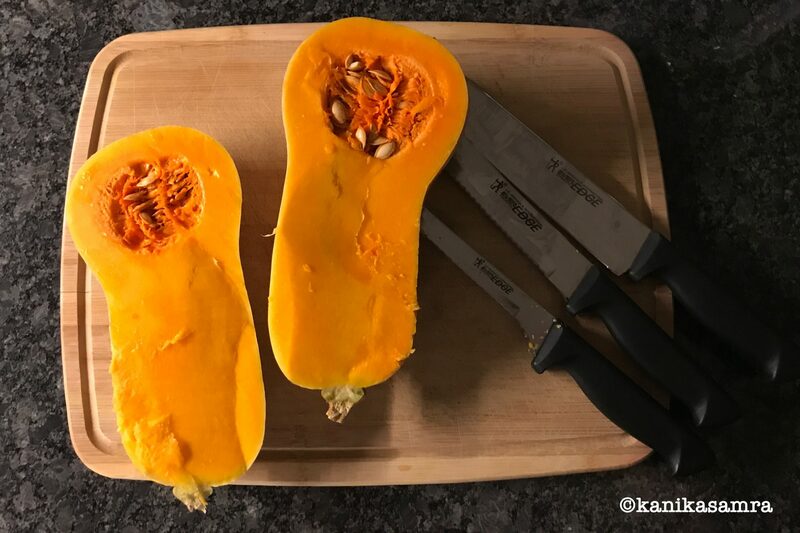 Butternut squash is so delicious and versatile – I love your spices! Thanks Ramesh! This recipe has delicate flavours and kaddus that do not have a strong aroma or taste do well with this tadka. If you try it, do tell us about it!